A healthy, smoky, and delicious choice for barbecuing. Turkey isn’t just for the holidays. 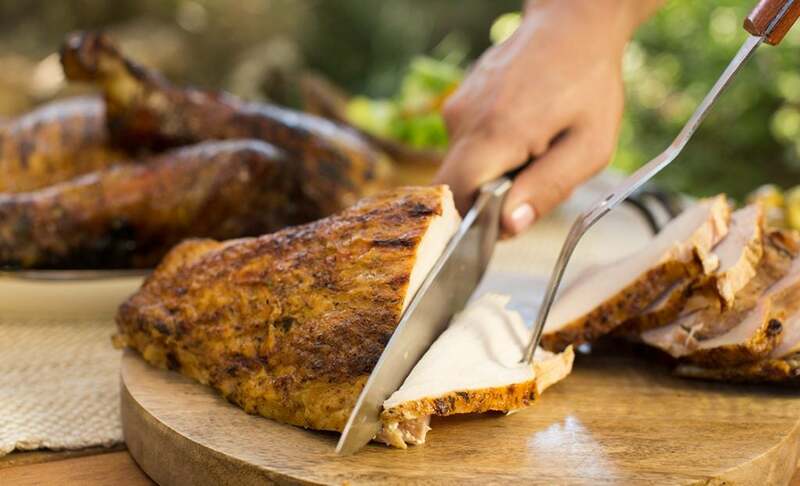 Barbecued turkey pieces are a healthy and delicious option, year-round. The barbecuing technique is identical to cooking bone-in chicken pieces over a two-zone fire. But the results are spectacular—decadent drumsticks to chew on and smoky breast meat for sandwiches and more. All in just seven simple steps. While not essential, we recommend brining the turkey to keep the meat from drying out. When you brine, you simply soak your turkey breasts or drumsticks in a salt and spice solution for up to 12 hours. Brining is key particularly for turkey breasts since the breast meat tends to dry out. You can brine in any container large enough to hold your turkey pieces and keep them submerged that will fit in the refrigerator. If you choose to use a cooler, be sure to use lots of ice to keep your turkey parts cool and safe to eat. Season your turkey to your liking, using a light coat of olive oil, salt and pepper, and your favorite herbs or BBQ rub. Set up your coals in a two-zone configuration. 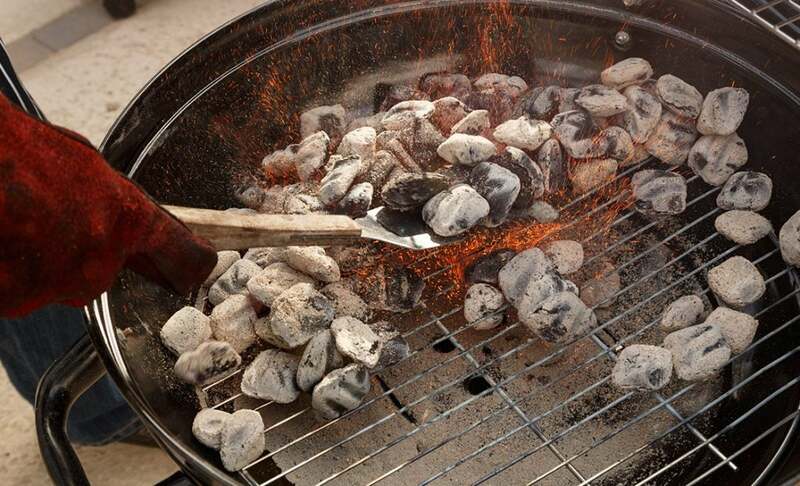 Keep all your hot coals on one side of your BBQ, leaving the other side empty. It’s a great way to sear the meat over high heat and keep a void space in case of flare-ups. Place the turkey pieces on the hot side of the grate, directly above the coals. Sear all the pieces for about two to three minutes per side, turning only once, until golden brown, making sure to not let the skin char. For leg pieces, give them a quarter turn every 90 seconds. If the BBQ flares up, temporarily move the turkey away from the coals. When all the pieces are properly browned, move them to the warm side of the grate. Replace the lid and adjust the vents to bring the temperature up to 350°F. Cook until the turkey pieces reach the desired internal temperature. Smoked turkey breast makes an excellent sandwich—and big, meaty, smoky drumsticks are a treat. 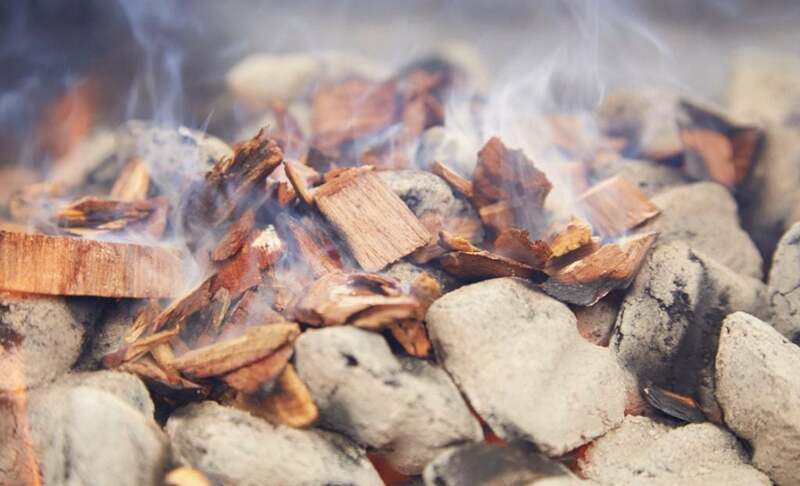 Add about two cups of Kingsford® Wood Chips with Hickory or large wood chunks. Fruitwoods like apple or cherry wood work well, providing a more subtle smoke flavor. Be sure to soak the chips for at least 30 minutes in water before spreading onto the coals. Turkey pieces are often large and may take longer to cook completely than you anticipate. Use a meat thermometer to monitor progress. 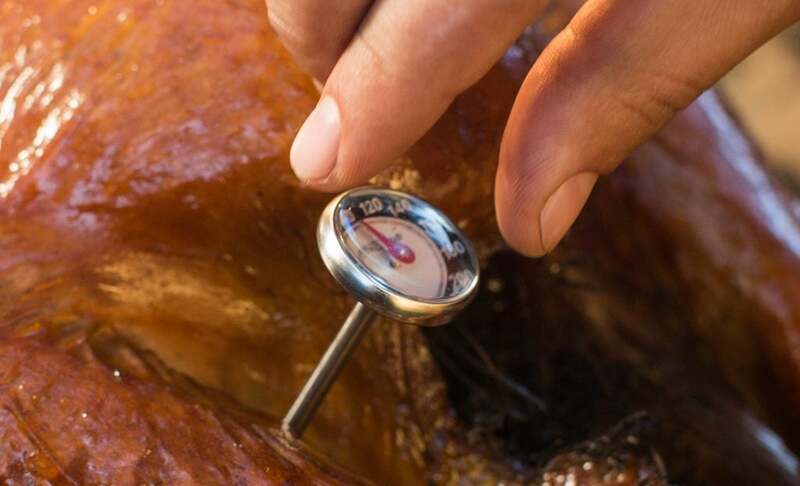 Turkey is cooked through and safe to eat when the temperature reaches 74°C degrees inside the thickest part of the breast or about 79°C for the dark meat on the drumstick. Let it rest, then dig in. Let the turkey pieces rest for 20 minutes or so prior to eating. This allows the juices that you created through brining to redistribute evenly throughout the turkey pieces. This is particularly true of the breast, which runs the biggest risk of drying out if you slice it too soon. When slicing the breast, cut the breast from the keel bone and ribs and remove it in one piece. Then slice across the grain. If your goal is sandwiches, wait before you cut. Turkey is easier to slice when it’s cold and the flesh has firmed up. If you can wait that long, refrigerate the grilled breast overnight after cooking for thinner slices.